The annual Ladies Day returned to Lendy Cowes Week on Tuesday, August 7, this year supported by Title Sponsor Lendy, with a number of celebrations culminating in the announcement that Tracy Edwards was the winner of the Ladies Day Trophy at an exclusive evening reception held at Northwood House. Tracy Edwards is most famously known for entering the first all-female crew in the 1989/90 Whitbread with Maiden crossing the start line on September 2, 1989 and sailing into the history books. Maiden went on to win two of the legs and came second in class overall. The best result for a British boat since 1977 and the best result for an all-female crew ever. Tracy was awarded the MBE and became the first woman in its 34 year history to be awarded the Yachtsman of the Year Trophy. In 2016 Tracy worked tirelessly to rescue Maiden and bring her back to the UK; after the extensive refit Maiden will inspire another generation through a huge global campaign to raise awareness and fundraise for access to education for girls denied this basic human right. Tracy was unable to attend the reception but newly announced members of her crew who were attending the reception accepted the trophy on her behalf. 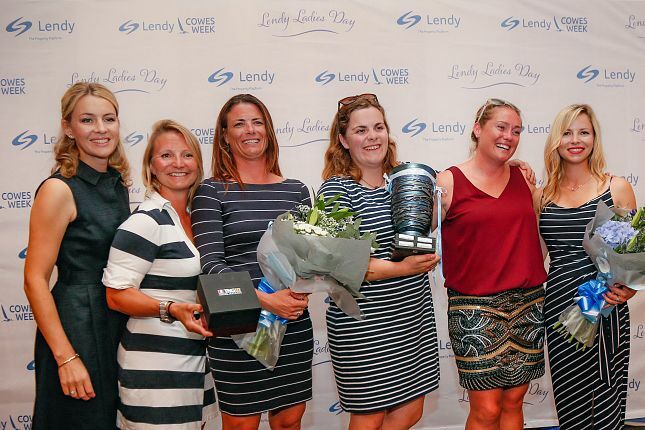 Paul Riddell, Head of Marketing and Communications at Lendy said, &apos;Lendy Ladies&apos; Day 2018 is a fantastic opportunity to celebrate hundreds of the country&apos;s greatest female sailors who make Lendy Cowes Week such a world-renowned regatta. Lendy is absolutely thrilled to sponsor the day this year, in recognition of the outstanding contribution, commitment and achievement of women in sailing. Lendy Cowes Week will conclude on Saturday, August 11.